A very fast cheat's move to switch a pair of dice for a crooked set is the Casino Thumb Palm Switch, which can be very hard to spot when used by an experienced switcher. This one handed move is incredibly deceptive and, when practiced, is so smoothly done other players will barely be able to notice it. This move is done by clenching the two crooked dice in the palm by holding the thumb slightly across and towards the fingers on the inside of the hand. As the cheat reaches out for the straight dice the crooked ones are taken into the bend of the second, third and little fingers (Fig. 1) while the forefinger and thumb are lined up above the straight dice. 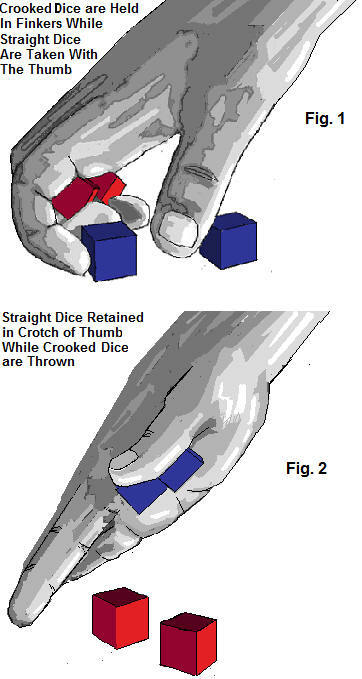 The straight dice are then pushed back along the inside of the thumb where they are held in the thumb's crotch as in Fig 2. The crooked dice are then simply thrown out with no one the wiser. You may be able to spot this move by watching the switcher and seeing if they pull back their hand too close to their body or out of sight too often whenever they are picking up the dice. This may mean they are hiding the switched dice in their pocket or somewhere else out of view.